Performing and listening to music is often lauded as a great way to enhance math skills. Therapists now realize the full significance of tapping into the music memory centers of the brain to enhance language, emotional cognition, social understanding and sensorimotor perception. Strengthens mouth muscles for eating and speaking. Helps children with social and communication delays relay their needs. Lessens the effects of dementia. Helps minimize pain for hospitalized patients. Helps reconnect eye/brain connections with certain vision problems. Helps infants with sleep and weight gain. Helps improve motor function in people with neurological disorders. Seven-year-old Brady loves music and he comes by it honestly—Mom Melonie is a jazz pianist and Dad Justin is a bassist who has played with local jazz greats Steph Johnson and Rob Thorsen. Brady has an ASD diagnosis and although he was nonverbal as a toddler, he has always loved to sing and he learned to read at age 3. But Brady struggled with expressing himself, which sometimes caused frustration and undesired behaviors. Because Brady’s family was so immersed in music, they discovered that using music therapy provided meaningful engagement. “In the beginning, Brady went to speech therapy,” says Melonie. “It was a lot of repeat, repeat, repeat.” He received other early intervention, but it was the switch to music therapy that finally broke through. 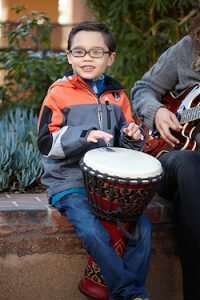 To increase oral motor strength, Angela Neve, a founder of Music Therapy Center of California and the nonprofit Banding Together, helped Brady use a flute to strengthen muscles around his mouth. He graduated to interjecting words into songs and nursery rhymes played on the piano. “A metronome was in the background keeping time,” explains Melonie. The rhythmic beat encouraged Brady to insert the rhyming word quickly to keep in time. Most people have an internal “metronome” that provides speech cadence and cues as to when to respond to questions. The use of a real metronome encourages answering within a socially appropriate response time. Today, Brady’s goals focus more on comprehending his emotions and social understanding. Therapy sessions include time for a piano lesson and Neve incorporates Social Stories into songs to teach pertinent actions to social situations. Six-year-old Trevor has hemimegalencephaly, a rare congenital brain anomaly in which one half of the brain is significantly larger than the other and the swelling can cause seizures. As an infant, it caused epilepsy and infantile spasms. Trevor had a hemispherectomy in which a large portion of the right side of his brain was removed. When one side of the brain is surgically removed, the remaining healthy side may gradually take over the functions previously supported by the affected side. This brain plasticity can be enhanced using occupational therapy, speech therapy and physical therapy by exercising the body to help recreate neural pathways in the brain. 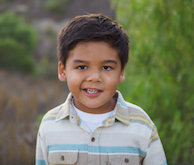 Trevor also experiences vision problems and speech/language delay. He was receiving speech therapy at school, but it was his parents’ decision to try music therapy that really made a difference. “I went to a hemispherectomy conference and several parents were talking about music therapy,” says Mom Kelly. Trevor began taking classes at age 3½ at Michelle Lazar’s Coast Music Therapy. “When he was little, Trevor had oral motor needs. There was some drooling,” says Kelly. This is common with children with infantile spasms and those who have been tube fed for long periods of time. The mouth muscles are not only important for eating, but also for articulation and communication. At Coast, the use of harmonicas and a slide whistle helped build Trevor’s mouth muscles. It also increased lung capacity as he had to maintain the expulsion of air to get a long, steady sound. Coast’s “Tuned in 2 Learning” program helped tackle Trevor’s sight and verbal delays. The books provide visual cues that relate to songs about desired skills, such as building social connections or tooth brushing. The simple, clear pictures and words tell a story enhanced by music to help build the eye-brain connection. Today Trevor attends sessions with Vanessa Contopulos at Amplify Music Therapy, which has also been a fabulous experience. Therapy includes the use of a melodica, a flute-like instrument with piano keys, which has the added benefit of strengthening his fingers. Neurologic Music Therapy strengthens the left side of Trevor’s brain to improve gait and balance. He practices crossing one leg over the other and holding the pose for a few seconds. The long musical notes denote the holding process while a short, single note denotes the end. Stimulating music perception while performing a physical task strengthens vestibular connections so Trevor can walk more easily and rebuild neural pathways lost in surgery. For more information, visit www.themusictherapycenter.com, www.amplifymusictherapy.com and www.coastmusictherapy.com. Local jazz musician Steph Johnson has been in the national spotlight for creating Voices of Our City Choir, a group of musicians and homeless choristers who perform at events to shed light on the needs of San Diego’s homeless community. Johnson was nominated for Artist of the Year and Best Jazz Album in the 2017 San Diego Music Awards. When Johnson is not performing with her trio or the choir, she jams with Banding Together, a local music program for children and young adults with special needs. 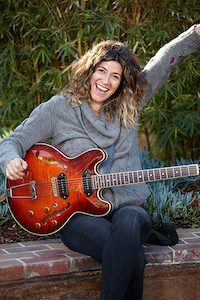 Banding Together provides instruments, music therapy scholarships and jam sessions with artists like Johnson and her partner Rob Thorsen, led by a certified music therapist. For more information, visit www.bandingtogethersd.org and www.stephjohnsonband.com. Emily Dolton is a contributing writer and special needs resource parent.